The decision follows reports of hundreds of arrests in Venezuela, including the arrests of police officers, for looting groceries, markets, and pharmacies in the nation’s most impoverished communities. “I have decided to prolong the use of the 100 bolívar bill until January 2 through an emergency decree,” Maduro announced on his television program In Contact with Maduro on Sunday. Maduro had given Venezuelans 72 hours last week to return all their 100 bolívar bills, previously the nation’s largest denomination, to the nation’s banks in exchange for new, larger currency denominations intended to streamline economic interactions in light of the growing hyperinflation crisis in the socialist country. Maduro failed to deliver the larger bills, however, ranging from 500 to 20,000 bolívars in value, triggering mass looting, bill burning, and protests. On the same television program, Maduro announced that the new 500 bolívar bill was finally on its way “after having suffered sabotage.” “The new 500 bill should have arrived Thursday, it arrived today Sunday,” he announced. “They couldn’t stop it, they just held it back four days,” he added, without specifying who “they” are. Maduro has previously accused the United States of waging “economic war” against Venezuela, a claim the White House has vehemently refuted. Maduro did not announce when the 500 bolívar bills would be available for distribution, however. Venezuelans waited for hours in bank lines between Tuesday and Thursday last week to hand over their 100s only to find that the banks had nothing to trade them in for. Their money rendered worthless, Venezuelans began to ransack businesses for food, medicine, and other valuable goods. Reports indicate that between one and three people died and over 300 people were arrested over the weekend, according to Reuters. The worst of the looting appears to have occurred in Bolívar state, where Reuters notes 262 of the arrests occurred. 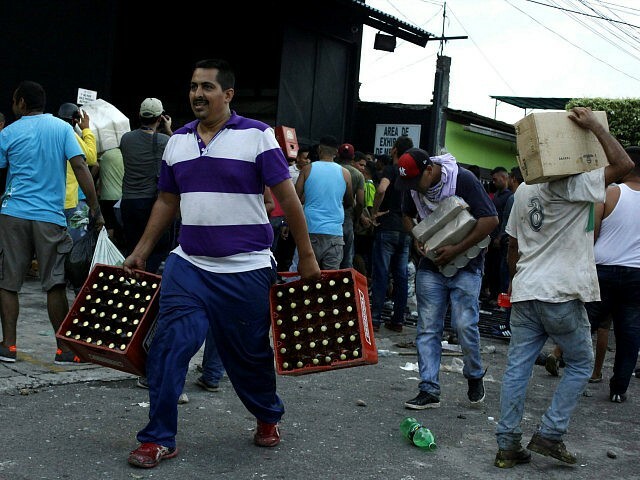 90 percent of Bolívar city’s businesses were looted over the weekend, Reuters notes, including many not selling food. El Correo de Caroni, a regional newspaper, published a harrowing account of the violence in Bolívar over the weekend, noting that “hardward stores, car dealerships, kiosks and pharmacies” came under attack. The newspaper adds that Chinese-run businesses were particularly vulnerable to attack, describing “an Asian-looking man, kneeling, lifting his hands to the sky as if reproaching some higher power for the destroyed business behind him. El Correo de Caroni also reports that among the looters were at least four police officers, arrested carrying various boxes of goods on their police motorcycles. In addition to businesses, local reports note that looters attacked the cafeteria at the University of the Andes and private homes, including the apartment of champion fencer Maribella Hurtado. Maduro has claimed that many of those arrested are members of the anti-socialist opposition, “the parties of the ‘gringos'” looking to sow chaos on behalf of President Barack Obama. Reuters notes that, in some communities, civilians have formed vigilante groups to protect the local businesses. “We’re not lowering our guard, we’re forming protection brigades,” a business leader told the outlet. Not all who spoke to Reuters appeared as determined to fight back. “As if we don’t have enough to cope with anyway, now they inflict this craziness on us… it’s like a cruel joke,” 74-year-old Zoraida Gutierrez lamented.